You can rent rods for ½ day ($15 + tax) or full day ($25 + tax). The rental rate includes the use of our bait bucket and one dozen live shrimp per rental. We have pier passes available that will act as your fishing license for $3.21 per day (24 hour period) but only cover fishing on our premises at Merry Pier. If fishing elsewhere – Fishing licenses are required and can be obtained immediately by phone 1-888-347-4356 or online (myfwc.com). Kids 16 and under do not need a license. Our helpful staff with assist you with any instructions you may need to get started. 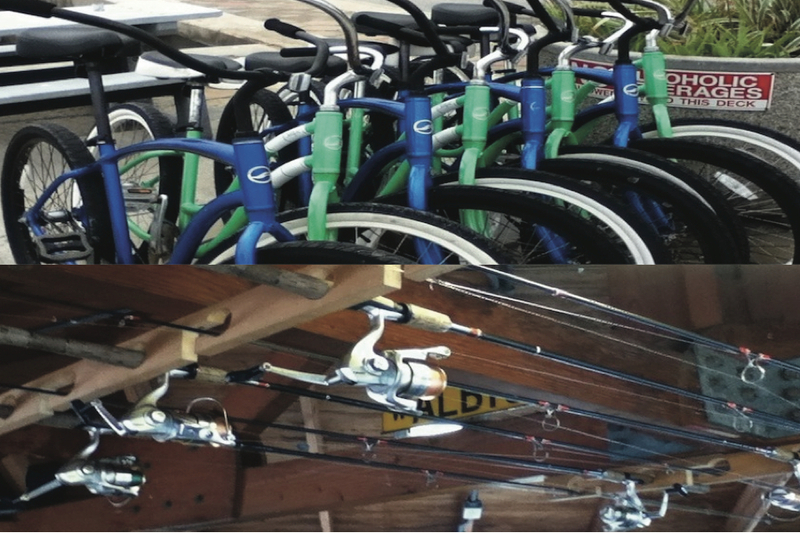 Our bicycles are beach cruisers and may be rented by the hour ($8.00 + tax), the day ($25 + tax) or the week ($65 + tax). Rental rates include the use of a helmet and a bike lock. Baskets can be added for just $2.00. All rentals require a deposit so please bring your driver’s licenses or a credit card at the time of your rental.